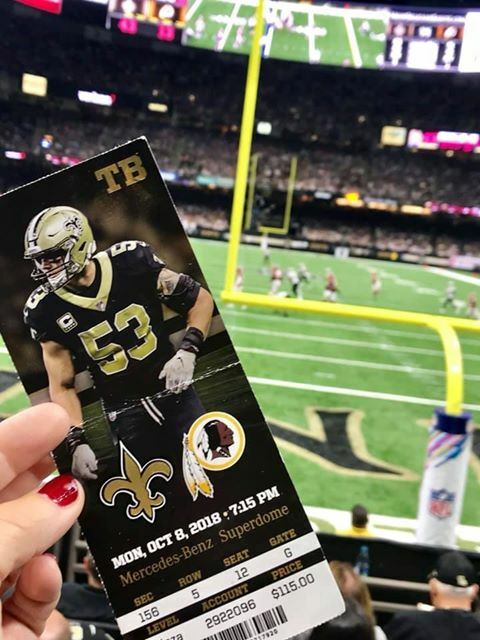 Following along as Maverick, a Britballer, captures his 2 week journey stateside as he goes to New Orleans to watch Monday Night Football before a road trip to the NFL Hall of Fame then heading to D.C for the Redskins Vs Panthers. From Washington D.C to Los Angeles and even a draw at Wembley I will follow my team through the good times and the bad come rain or shine. (or -12 degrees in New York). 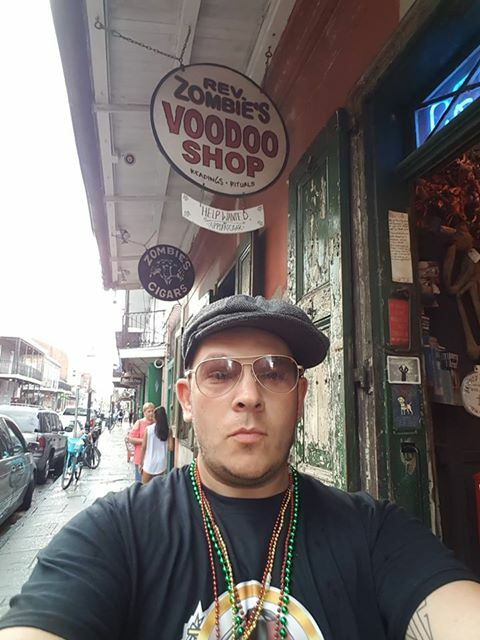 Yesterday morning I set off on my annual trip stateside from London Heathrow to Washington Dulles and after jumping on my connecting flight to New Orleans I arrived in NOLA safe and sound a journey that took 18 hours from start to finish. This is my first trip to NOLA and my first impressions are most definitely ‘Blackpool on Steroids’. Having checked into my hotel I decided to take a little time to walk the city in the hot and humid heat. From Unicorns with wings pulling carts of tourists (Yes, I said Unicorns) people dressed up in numerous attire, I actual bumped into a pack of human cats! To the endless bachelor and bachelorette parties and not to mention wedding processions with one having their own 30+ strong brass band. 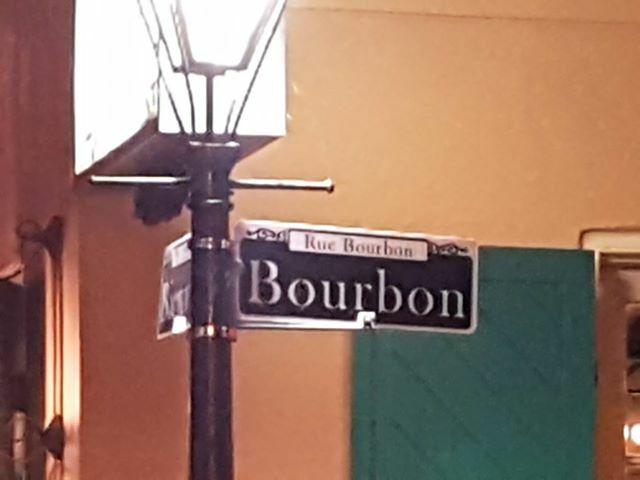 The famous Bourbon Street is the SoHo of the area with its endless Gentlemen’s clubs and colourful atmosphere truly lighting up the entire city. The shops are stacked with endless tourism gifts and enough beads to line the roads from Lands End to John O’Groats. The streets were busy, live music on nearly every corner from the array of street entertainers and the smell of fried chicken in the air. NOLA is certainly a very interesting place. Bed time called and with it my first words for you the Britball Nation to follow my football road trip 2019. Check back in soon to see what else I get up to over the next week and where my adventure’s may lead. Drifting in and out of a jet lag sleep is something you thought I would have gotten used to by now but the 6 hours’ time difference really throws off your body clock. It was around 8am I decided to grab some fresh air and seek out some breakfast. Whilst stocking up on water and essentials at the local Walgreens store this is when I came across ‘Caramel M&Ms’ these are truly Americas hidden gems OMG! 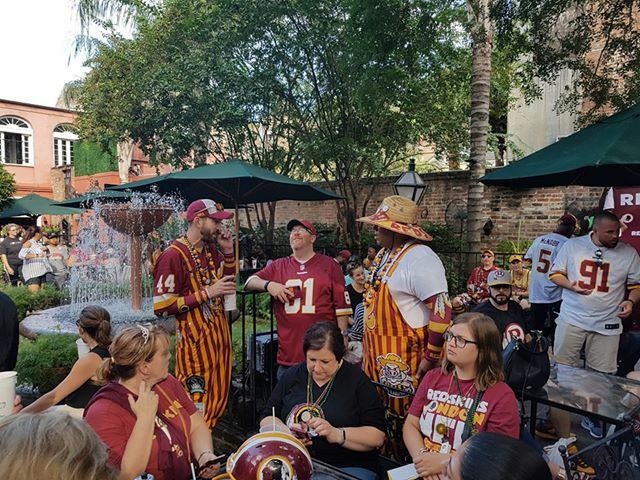 After a morning of relaxation and watching NFL Sunday Preview it was time to meet up with some Redskins friends and head to the rally bar, Pat O’Brian’s located in the French quarter just off Bourbon Street. O’Brian’s was already a hive of activity when I arrived and my friends the ‘Redskins Tweet Tea’ had already settled into their little part of the bar. The Burgundy and Gold was on full display the drinks had started to flow and it was great to meet old and new redskin’s friends. The first round of Sunday games started to kick-off and whilst our group indulged in food and drink the majority were keeping an eye on the Panthers Vs Giants game willing the Giants to implode as they have done all this year. 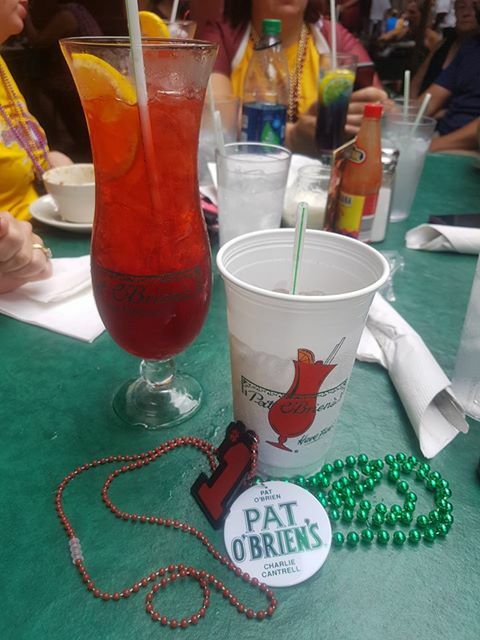 As the afternoon went on the female contingent of our group continued to down the famous NOLA drink the ‘Hurricane’ a concoction of alcohol from a recipe kept top secret. 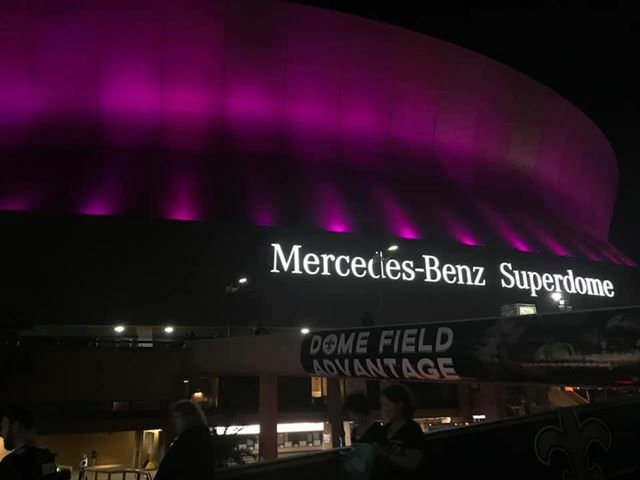 I was not the only Britballer abroad at this event as I met a trio of guys from the ‘London Blitz’ who were doing a road trip of their own having travelled down to NOLA after watching the Colts Vs Patriots on Thursday Night. As the bar continued to pack out with Redskins fans the first cheer of the afternoon was loudly herd as Panthers and former Redskins Kicker Graham Gano tied a league record for a game winning field goal 63 yards with just 10 seconds left on the clock to drop our NFC East rivals to 1-4 making the mood in the bar even better. The second round of games kicked off and this time our attention was on the Eagles Vs Vikings match up and a game that caused great conflict with Redskins fans. 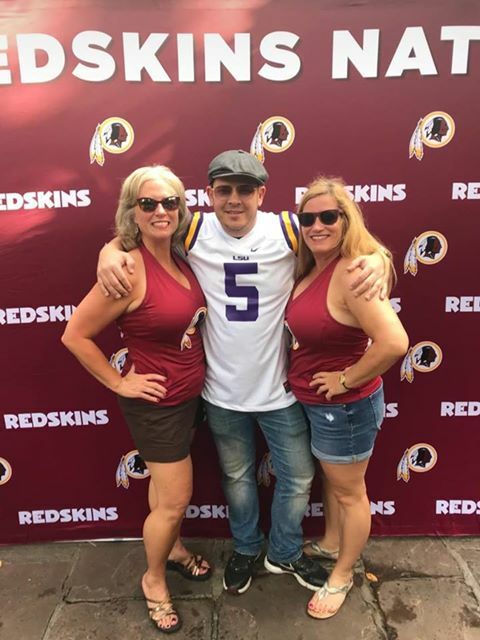 The choices were support our former QB Kirk Cousins and his Vikings or feed our bitterness and hope Cousins gets a really beating by our NFC East rivals. For me it was the first and Cousins came up with the goods downing the reigning Superbowl Champions and keeping them a game behind us in the NFC East Division (2-3). 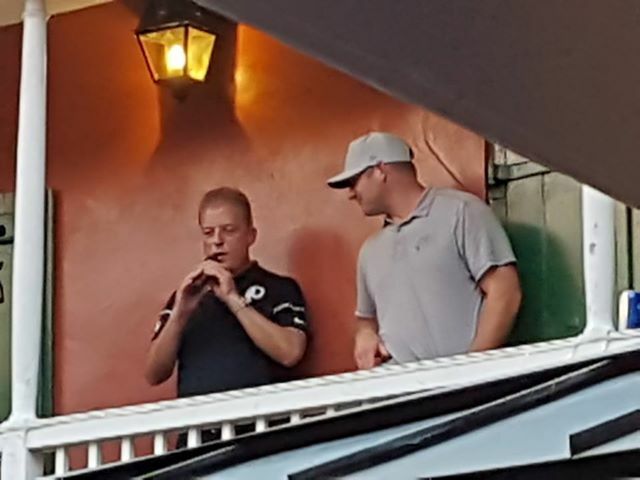 An attaché of Redskins officials turned up later on in the evening to hand out some free goodies to the crowd before Redskins TV host Larry Michael and former players Chris Cooley and Doc Walker appeared on the bars balcony to gee up the crowd and hype up tomorrow’s game Vs the Saints. After spending the last 8hrs on my feet at the rally bar it was time to depart and finish off the day watching the late game battle for Texas, Cowgirls Vs Texans. Arriving back at my hotel and in the air-conditioned bar I settled with a small group of fellow Redskins to watch the game and enjoy the best pizza I have ever eaten. The day was completed as the Texans won and made it an NFC East rival white wash of losses meaning the Redskins without touching a ball for over two weeks (last week bye) were still top of the division. A win tomorrow will give the Redskins a 2-game lead in the conference. With the top defence in the league currently Vs Drew Brees who is just 202 Yards away from claiming the all-time NFL passing record. Monday night football in NOLA is surely going to be a real experience no matter the result. Please check back tomorrow and follow my Game Day adventure, from tail-gate party bars to the full game day experience in the Super Dome. It was 2pm local time when the group of Redskins fans I had attached myself to boarded the party bus. 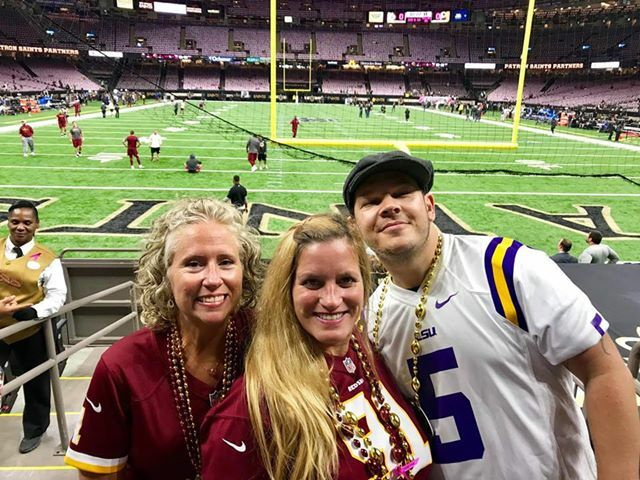 After a short tour of the more prestigious areas of NOLA and driving past the residence of Archie Manning and the house featured in ‘American Horror Story’ we arrived at our first tailgate bar the ‘Rusty Nail’ which was not rusty at all. The locals welcomed our burgundy and gold horde and we enjoyed drinks and songs as a pre-warm up for the evening’s event to come. 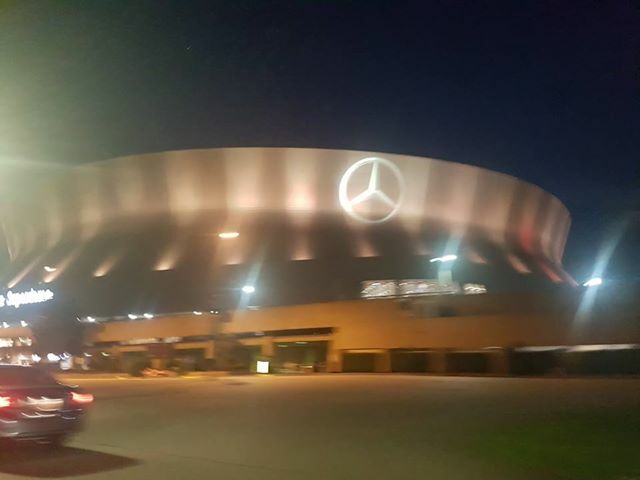 On route to the stadium we came across the Redskins players hotel and stopped off to cheer them on as they boarded their coach before we ourselves followed on to the famous ‘Mercedes Benz Super Dome’. Arriving at the Dome as the sun started to set was amazing and after a quick photo opportunity with my Redskins compatriots I entered the lower section. At this point I had really high hopes of a Redskins Victory and gaining a 2-game lead in the division. (How wrong was I). Now going into this game, I already had an appalling record when watching my skins live standing at 1-7-1 with my lone win last year at home Vs 49ers and a draw at our very own Wembley Stadium Vs Bengals. After tonight that record has dropped to 1-8-1! Now we may have been blown out 43-19 by the Saints, we may have been out coached and out played in every department, we may also have looked like a bunch of amateurs (no offence Britballers) but tonight was about a record and I was witness to one of the greatest achievements in NFL history. The Dome is LOUD and when I say LOUD I mean deafening, the only way to win here is get up quick and quiet this crowd as I have never heard anything like it. At the beginning of the evening Saints QB Drew Brees was just 201 yards away from breaking Peyton Manning’s all-time NFL passing yardage record, it did not take him long. In the midst of the 2nd quarter Brees stepped back into the pocket and threw a beautiful pass to WR Tre Smith who took the pass 62 yards to the house and with it the record was Brees alone. A short stoppage to the game followed as his team mates mobbed him and the fans paid homage to Brees whilst a personal message was shown on the screen by none other than the man Brees had just surpassed. 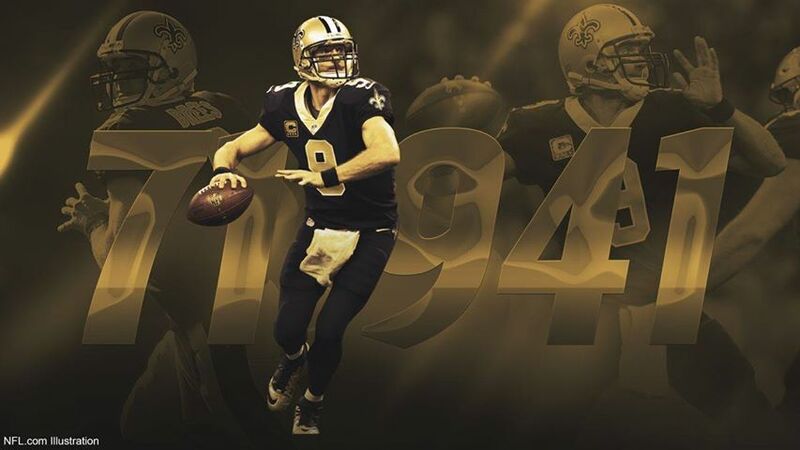 Brees would end the day with 363 yards and 3 TDs whilst claiming the record now having thrown for 72,103 Yards and 499 TDs meaning his next TD pass will put him in an elite group of the 500 Club. Brees has been nothing but a class act in his entire career and whilst I may have been hurting every time I looked at the score board it was a real honour to witness a piece of NFL history. So, with the final whistle here on my trip to NOLA I will leave with real mixed emotions, a result I didn’t expect, history was witnessed in a city that never sleeps, new friends were made and memories that will last forever. Oh, and despite that result the Redskins are still top of the NFC East! After a disappointing Monday night from a Redskins fan perspective it was time to catch my mid-afternoon flight back to D.C. via Houston. Arriving back in D.C. I immediately headed to the rental car lot to pick up my wheels for the next week. With a Gold choice of cars, I could have gone for something flashy or BIG but my sensible side kicked in and I settled for a mid-sized KIA for the sole purpose of low fuel consumption and so not to dent my pockets on my travels too much. It was 7pm when I hit the road and with a 350 mile cross state journey ahead of me. I wanted to drive as far as I could before tiredness kicked it. I made it till just before midnight having covered 150 miles and settled for a cheap motel (Dollar Inn), my head hit the pillow and I was out! With the rise of the morning sun it was time to hit the road again and drive the 200 remaining miles to my hotel in Canton. Avoiding toll roads, I took the scenic route and passed through some real rural country before driving under a mountain to enter the city of Pittsburgh. Passing Pittsburgh and finishing the drive to Canton it was time to find my favourite eating place stateside ‘Denny’s Dinner’. Another day in the books and my trip had reached the half way stage. Canton is a small town with a big reputation and as I approached the Hall of Fame Stadium it was apparent I was in for a treat. It was a quiet day with only a handful of visitors at the Hall so it was easy to just take my time and soak in all the nostalgia as well as laugh and pose for a pic with Drew Brees Uniform and Ball that was already in place from his record-breaking display on Monday night. The room that holds all the legends busts is breath taking and it was funny to see which ones were spot on and which ones were a complete bust, pardon the pun (Dion Sanders). The Superbowl movie theatre was the highlight taking you through a 360-angle tour on how the Eagles won the big one for the first time in their franchise history. After my camera space on my phone was full and I’d browsed the souvenir shop I returned to my car and hit the road again for the return journey back to D.C.
As a fan that has travelled to many stadiums in the NFL I thought it would be rude not to stop off at Heinz Field the home of the Pittsburgh Steelers for a short tour of the stadium and at just $8 why not? I arrived in good time but looking at my ticket I’d booked for the following Friday like a complete donut! However, the guys at the stadium were real cool and said it didn’t matter. The tour lasted around an hour and was led by a loopy 60-year-old Chinese women but she knew her stuff. We were allowed into the Steelers changing room, the press box, a game day suite ($46,000 per year 10-year lease) and out onto the edge of the field. It’s a nice Stadium and I’d definitely return for a game one day in the future. With the tour done, my car fuel tank topped up with gas I drove 300 miles straight all the way back to Washington D.C. for my final stop before returning home on Monday. 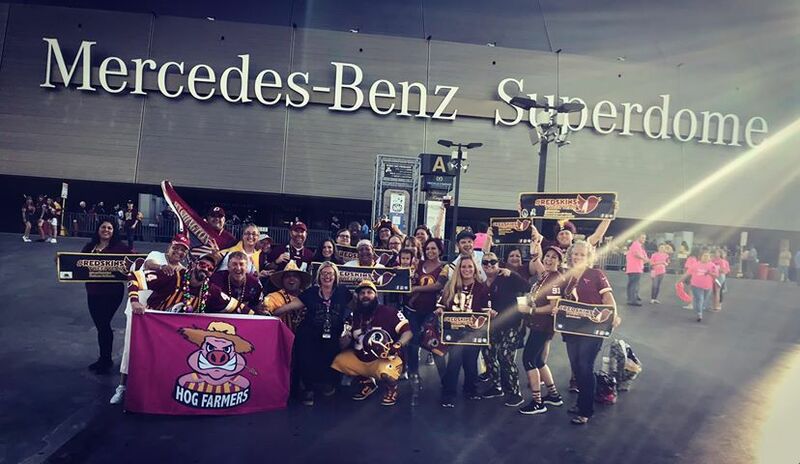 Days 9-10 - October 13th-14th 2018 - Redskins on the Rise! After Fridays ‘PITT STOP’ and then the non-stop 300-mile drive back to D.C. I finally arrived during the early evening and after checking into my hotel decided an early night and some chill out time was needed. Saturday was to be my day to shop. It’s always nice to check out the sports stores and numerus discount outlets whilst in America to take advantage of the low-cost sports brands meaning more dollars for my pounds. I received late afternoon message from my good friend and American book author Steven Rosenberg, please check out his book ‘Going Full Speed’, a tale about the late great Washington Redskins Safety Sean Taylor written by Steve and in conjunction with Sean’s father Pedro Taylor, available on Amazon. A great read for any American Football fan and a must for all fellow Redskins. Steve who splits time between his home in D.C. and his vacation apartment in Miami just happened to be in town and offered to take me out to dinner at the famous D.C. restaurant ‘Theismann’s’. Theismann’s owned by the former Washington Redskins Superbowl winning Quarterback Joe Theismann was a classy establishment and the food was excellent just like Joe's performances on the field. After dinner Steve and his wife took me on a tour of downtown D.C. and past all the famous monuments so I could see them lit up at night, but with tired eye’s and an early start for the afternoon kick-off of the game the next day it was time to call the evening early and return to my hotel for some well-earned rest. Steve being the classy guy he is and with the connections he has then presented me with a parting gift, a Redskins T-Shirt signed by two of the all-time greats O-Linemen and former Hogs Joe Jacoby and Russ Grimm. I can honestly say I have met some real nice people on my travels but non-as generous as Steve. My final day in America was to be had attending my second game in a week the home fixture at Fed Ex Field where the Redskins were hosting the Carolina Panthers. With my poor attendance record at live games now standing at 1-8-1 after the humiliating loss in Drew Brees Record breaking night in New Orleans to say I thought that losing feeling would continue would have been just. However, the optimist I boarded the Metro line and rode the hour-long journey out of town for my 3rd ever visit to Fed Ex Field. Waiting till just 30 mins before kick-off I purchased my game ticket threw the ticket site stub-hub grabbing a ‘DREAM SEAT’ for $180 plus ridiculous stub-hub admin charges. The ‘Dream Seat’ was located directly next to the players tunnel a front row seat, padded for your comfort and with it a 25% discount voucher for the club shop and unlimited soft drinks, hot-dogs and cookies for the duration of the game. (Now this ticket would retail at $350.00 value at first release so after taking on-board the free food and drink and the money I saved in the club shop during halftime it paid for itself). The game itself was fantastic after jumping out to a 17-0 lead I was in fan heaven, never having beaten Cam Newton since he entered the league the Redskins were on course to beat the Panthers for the first time in 8 years. A second half comeback in true Cam fashion made it ‘squeaky bum’ time come the 4th quarter and with a final stand on our own 5-yard line I finally witnessed just my second Redskins victory live. (2-8-1). The Metro ride home was fun and the buzz surrounding the fans and the team was amazing, a sign of things to come I hoped! After arriving back at my hotel, it was time to pack whilst watching the late slate of games and polish off the snacks that were still in the mini fridge in my room. Another adventure over, another football trip in the books. Role on Miami 2019 and Las Vegas 2020! - A Britballer Abroad 2018.